My husband saw a commercial for the KFC chicken bowl and thought it looked mighty tasty. I agreed, but decided to forgo killing ourselves by clogging our arteries...so I came up with this alternative to the chicken bowl, but it's just as tasty. (Even admitted by the hubby) Of course, it's pretty self-explanatory, but it was a fun dinner for us. I served it with whole wheat biscuits on the side. Ingredients: potatoes (I used instant in this case, but I love home-made mashed potatoes with sour cream, some butter and some milk mixed in!) 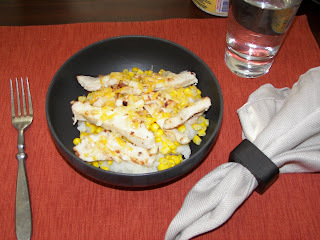 grilled chicken strips corn (frozen worked great) grated cheese Layer the potatoes, chicken strips, corn and cheese. If you layer these while they're hot and just wait a few minutes to serve it, the cheese gets all nice and melty as the picture shows.